I’m such a big fan of goals! I learned a lot about goal setting and how to create realistic goals when I worked a lululemon 6 years ago. It was a huge part of the company’s culture and it was a game changer for me. I found that setting goals gave me drive and direction. I also gave myself the permission to change my mind if I wasn’t into the goal anymore, I would change it or remove it. A program I’ve started using is “SimpleMind Map” (you’ll find it in the app store for desktop), mind mapping is a concept my dad introduced me to a long time ago. 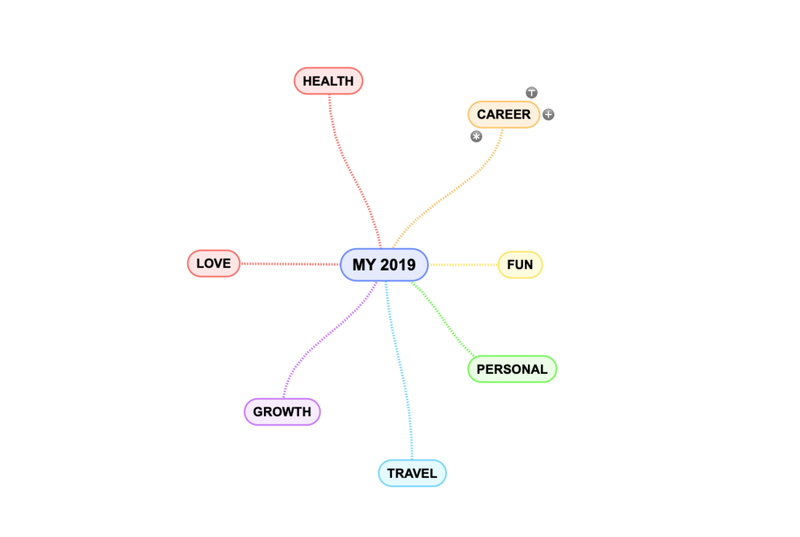 Basically what I did for this year was combine my goals into a mind map. I’ll give a simple example below. I decided on my categories. For me it was Money & Career, Fun, Growth, Travel, Health & Self-Care. Depending on what my focus is my categories might change every 6-12 months. I expanded on each category. This was my time to dream. I put anything and everything I’ve been thinking of. Don’t limit yourself and take money out of the equation. A little example is below. When I felt complete with what I did I highlighted all the things that we’re going to cost money and how much they would be. When i do this i can easily identify them and remind myself that’s what I want to invest in this year, this way I won’t spend money somewhere else. For every goal include steps to get there so you don’t get overwhelmed by the overall goal. If you want to make $100,000 this year how will you realistically get there? I spent about 30-60 minutes when I first started the mind map and then came back for 10 minutes everyday for a couple of weeks. The more I got into thinking about my goals the more I wanted to add. Now that I’ve shared a bit more about my goal setting process I’d invite you guys to do the same if you haven’t already. I find this process super helpful whether you’re an entrepreneur or not. It’s important to have goals to work towards. Learn a proper dance with Mike before our friends wedding. Redesign and organize my office. Be more aware of my finances. Invest more time into YouTube. I love this platform for all the memories to look back on and to pass on any knowledge I know. More date nights with Mike. If you have some goals in mind already I’d love to hear them in the comments!